For a limited time it's all yours FOR FREE. We give you the most standard equipment. Large diameter 0.080 gauge pontoon tubes - 25"
A warranty that makes you say wow! 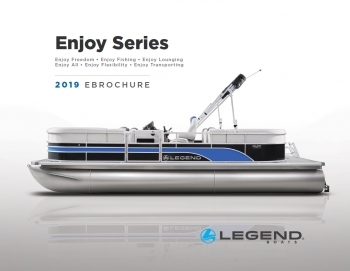 Legend pontoon boats are backed by a lifetime warranty on the pontoon tubes, deck, and transom so you will be assured of hassle-free boating for years to come. Plus our exciting 6 Year WOWranty now extends coverage on all your key components. Legend ProTech All-Synthetic Tear and Mildew-Resistant Material is backed by a 5 Year Warranty and guaranteed not to rot or fade for five years. Stitching, zippers, seams and other top components are covered for 1 year. A thicker floor means a stronger boat. With 7 layers, each individually treated, we can offer a Lifetime Warranty against rotting. Every Mercury 4-Stroke, Verado and Optimax outboard is backed by a 3-year standard limited warranty to give you peace of mind. Ask us about Mercury Product Protection to extend your Mercury Factory Warranty for up to 8 years. Every Legend Glide-On trailer by Shoreland’r is backed by a 5-year frame warranty and 1-year complete tongue to tail light warranty. Select the Mercury outboard that best suits your needs from the motor choices below. Simply add the amount to the standard package price to have the motor that is perfect for you. DUPT2122A-16 $2,999 ~ Suitable for up to 2100 lbs. Explore the Enjoy Series eBrochure and customize your boat with any dealer installed accessory to truly your boat one of a kind!! "CLICK HERE" for more information. All of the components of your boat, motor, and trailer package have been specially chosen for compatibility. The professionals at your authorized Legend Dealership will help you select the proper motor and options for your package. They will then prepare your package to ensure proper and worry-free operation. The setup includes the following items: control box, shift cables, starting battery, aluminum propeller, outboard installation and set-up. Your dealer will prepare your package and give you a full orientation to ensure trouble-free boating from day one. The setup includes the following items: outboard installation and setup, propeller, fuel tank, starting battery on packages with electric start motor or utility boat models with lights or livewells. Your dealer will prepare your package and give you a full orientation to ensure trouble-free boating from day one. *Your ip address determines your location which allows us to give you your local, All-In, No-Fee price online. Some ip addresses may not properly reflect your actual location, which could affect the All-In pricing displayed. Licenses, and taxes are extra on all prices. Delivery is available at an additional cost. Payments are calculated with licenses, bank registration charges, and taxes as your downpayment at 6.49% over 780 weeks for amounts $10,000 and higher, and 8.99% over 364 weeks for amounts less than $10,000 (at time of printing). All financing is OAC. Payments will vary by province. All Choose your power prices are in addition and only available with the purchase of the specific package they are listed with; they are not stand alone motor prices. Premium Packages and Luxury Packages are model specific and are only available with the purchase of a boat package. Towing weights are approximate and are calculated based on a full tank of fuel and 200 pounds for batteries and gear. Speed tests were done with 2 persons, 50 pounds of gear and proper weight distribution. Actual performance may vary. Prices, rates and specifications are subject to change or error. Pictures may show options. Ask for complete details. All illustrations, photographs and specifications in this catalogue are based on the latest product information. See actual boat for complete accuracy. Legend reserves the right to make changes at any time, without notice, in prices, colours, materials, equipment, specifications and models, and to discontinue models or equipment. Massel's Marine is located in New Hamburg, a beautiful small town located on the Nith river in southern Ontario. Massel's has been a family run business since its beginning in 1932. Four generations have been committed to providing superior quality products and service to Kitchener - Waterloo, Cambridge, Guelph and the entire Southern Ontario Area.